You are currently browsing the category archive for the ‘baked’ category. I tried flying solo on grandma’s doughnut recipe yesterday and offer the following observation: a candy thermometer would be extremely helpful to check the temperature of the oil. At first the oil was too cool, so it was taking longer than the 30-45 seconds a side the recipe called for, but by the end of my test run I was starting to scorch the outside of the doughnut (not a good doughnut flavor) before the inside was fully cooked. As I suspected, there’s a little grandma magic involved in this seemingly simple recipe. And another Grandma tip: allow the doughnut oil to cool, then strain it through a coffee filter to reuse. You don’t want to mix old oil and fresh but you should be able to get a few more batches out of it. My mother-in-law came up to visit for the weekend and she’s always creating wonderful treats for us. Home-made doughnuts are one of her specialties and while she insists these aren’t *that* bad for you but I have my doubts. Either way, it’s hard to stop when you’re eating them hot off the stove. Allow bread dough to rise one time, then punch down, roll and cut out doughnuts (we had dog bones, hearts and doughnut holes this time). Allow the dough to rise a second time. Heat the oil on the stove to about 350-degrees (she used corn oil). Drop the dough in the oil — don’t let it stick to the bottom of the pan! — and cook for about 30 – 45 seconds per side. Powdered sugar, mixed with milk or orange juice to your preferred consistency. I’m not much of a baker, so these muffins were just the ticket — fast, easy, and all but foolproof. And they feature spring carrots, which are so sweet and crisp right now, at least the ones from the farmers markets. (Let’s talk about carrots from the garden next month. Or in June.) If you like, consider adding hazelnuts to the batter for a little crunch and a bit of protein. Holmquist Orchards grows them in Lynden, near the Canadian border. Preheat oven to 350 degrees. Grease a 12-muffin tin. Combine first eight ingredients, mixing well. Thoroughly combine oil, sugar, and eggs. Stir together flour and oil mixtures, then add in optional carrots and hazelnuts or walnuts. Pour batter in equal portions into greased muffin tin and bake for 20 minutes, or until browned and slightly crispy. Adapted from Martha Stewart. Okay, so these cinnamon rolls are not entirely local. But they’re entirely homemade, and sometimes that counts for just as much. Especially when your good friend Sandra went to the trouble of tracking down the recipe from a long-lost grad school classmate, who adapted her own rolls from the original Betty Crocker. And when your friend’s darling three-year old daughter puts on the baking clinic. These are classic, yeasty, fast-rise rolls, and they taste as good as they look. I personally like that the dough can go in the fridge overnight, which means you can have hot, lovely rolls for breakfast without keeping baker’s hours. If you don’t like nuts, make them plain or sprinkle in raisins. Just don’t tell me about it — baked raisins are weird. Stir yeast into warm water. Mix together cooled milk, 1½ cups flour, white sugar, salt, and oil in a large mixing bowl. Stir in flour ½ cup at a time until the dough is relatively easy to handle, then knead for 8-10 minutes, until softened and slightly elastic. Return to a greased mixing bowl and cover with plastic, allowing to rise in a warm spot until doubled in size, 1-2 hours. When doubled, roll dough out into a 12-inch x 12-inch square. Brush melted butter onto dough surface. Mix brown sugar and cinnamon and spread evenly on dough. Sprinkle on walnuts or raisins if desired. Starting at one edge, roll the dough tightly, then cut the roll crosswise into 12-inch slices. Place slices swirl side up in two greased 8-inch x 8-inch pans. Refrigerate at this point up to 48 hours. When ready to bake, place rolls in a warm location to rise until doubled, about 30 minutes, then bake at 350 degrees until browned on top, about 25 minutes. Meanwhile, stir together the powdered sugar and milk to make a thick glaze, and pour on top of rolls once cooled somewhat. Enjoy immediately. Makes a dozen. I’m stealing again, this time from Sandor Katz and his fabulous florescent book, Wild Fermentation. Katz suggests that bread yeast grows more obligingly without salt to slow things down, and that makes sense. I’ve now mixed up two batches of long rise artisan bread dough sans salt. Both looked quite happy and bubbly after their overnight rise, as though this was middle of summer and not the coldest month on record. 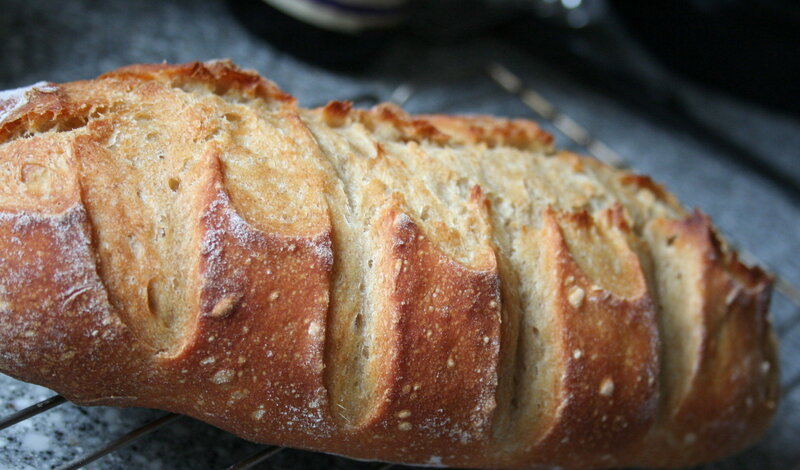 The trick would be getting salt added before baking, and I opted to knead the grains in on the second morning. Which brings us to the next item, kneading. Borrowing again from Katz, I worked a bit of additional flour into my dough at the same time I added salt, to give the yeast a little snack. 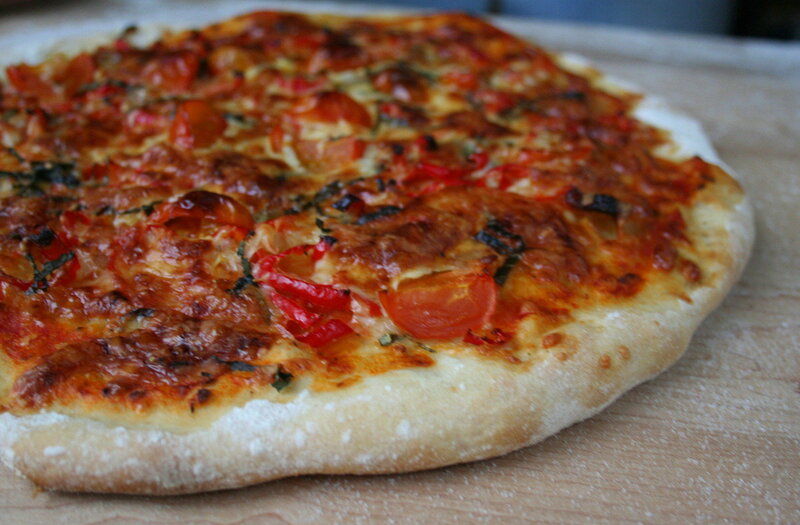 (My dough tends to come out pretty wet, so the extra flour firmed things up nicely.) Well. Not only did the loaf rise flawlessly, with none of those icky nubs you can get with homemade bread, but the flavor was also very good. I didn’t sample every single slice, of course, but the bread got eaten. Fast. The long-rise and five-minute people tell you not to handle your dough too much, and the thinking is that a long rise time allows lots of flavor and gluten to develop. But now I’m wondering whether a good knead or two on subsequent days might not hurt and maybe even helps. If someone can shed some light on these mysteries, I would like that. After reviving our supply of refrigerated bread dough last month, we’re back on a pizza-making jag. This week’s toppings include tomato sauce and chopped sweet peppers from the garden, fresh basil from a greenhouse in Duvall, and mozzarella from Greenbank Farm on Whidbey Island, which we get at the co-op. On a good day we can get one of these puppies into the oven in less than ten minutes. Bake at 450 degrees until the cheese is browned and you’ve got yourself some solid local eats. 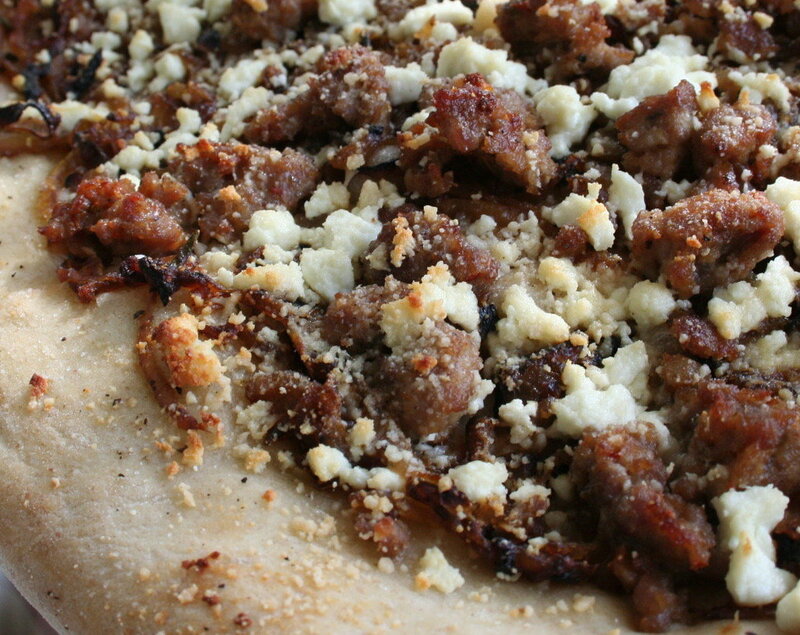 Check out a prior recipe for pizza with caramelized onions, rosemary, and goat cheese, an equally delicious if slightly more labor-intensive pizza that’s great as an appetizer or for a meal. I’m just not much of a baker, and when it comes to pies and pastries, I’d rather not know what went into my food. This recipe appealed to me because of the low butter-sugar quantities, which doesn’t sound promising, I know. But the scones are have an airy, cake-like crumb and wonderful flavor. I make them whenever I remember how much I like lavender, which is on the verge of blooming in the backyard right now. The scones freeze well, if they aren’t all gobbled down fresh. Heat oven to 400 degrees. In a mixing bowl, combine flour, sugar, salt, baking powder, baking soda, lemon zest, and 1½ tsp of lavender. Cut butter into pieces and cut into dry ingredients with a pastry cutter, or crumble in with your fingers. Separately, whisk together yogurt and buttermilk. Combine wet and dry ingredients to form a dough that will be wet and sticky. Turn dough out onto a floured surface and knead a few times, then shape into a square about 1′ thick. Using a kitchen knife, cut the dough into eight triangles. Transfer to an oiled baking sheet and bake 20 minutes, or until scones are golden brown. Remove from oven and cool on baking sheet. Meanwhile, dissolve powdered sugar in lemon juice and mix in ½ tsp lavender, then drizzle over scones. Adapted from Leslie Mackie’s completely fabulous Macrina Bakery Cookbook. We’re on a tear with handmade pizza lately, never mind that peak tomatoes and basil are a solid five months hence, and let’s not talk of when the season arrives in more favorably disposed locales. Who knew how simple and delicious this stuff could be? Right now the go-to toppings are sausage, mushrooms, flat-leaf parsley, olives, sun-dried tomatoes, and various and desultory cheeses. 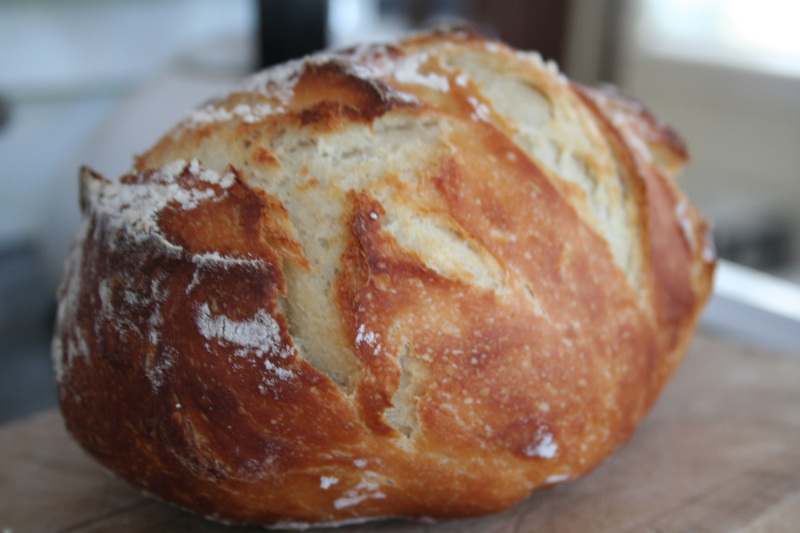 The best part of all is the crust, made from artisan bread dough that we keep going in the fridge. Since I’m now addicted to the stuff, I keep a supply of chilled bread dough that’s ready to bake at a moment’s notice. I use the previously posted artisan bread recipe, and these days pretty much every loaf turns out great. This has nothing to do with my skills; it’s all in the overnight rise and the old dough streaks mixed into new batches. So don’t fix something that isn’t broke, right? It’s taken me years to realize we cook in a drafty kitchen, 58 degrees this morning, and that’s why ordinary bread baking techniques have failed us. A big hint came by way of Jim Lahey’s No-Knead Artisan Bread, in last year’s NY Times — this recipe produced our first great loaves. Then came the Jeff Hertzberg and Zoe Francois “Five-Minute” method, quotation marks mine. Both skirt the drafty kitchen issue with a long first rise. I’ve now baked plenty with both recipes and made some mistakes along the way, a few of which proved adaptive for our peculiar kitchen. (Other mistakes were just mistakes). I’m happy to report that we’re finally getting killer bread with crispy crust and an excellent crumb.